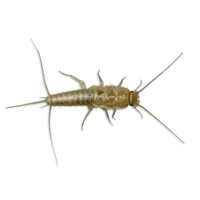 At Helliar Pest Control, we have many years’ experience in identifying and controlling silverfish infestations across a wide range of different types of business and residential properties across Somerset & Dorset. As with any pest, the best way to get rid of an infestation is to take away the conditions that gave them chance to reproduce in the first place. This can be quite difficult to do when it comes to silverfish, as the main condition necessary for their existence is damp. If you think you have a silverfish infestation, ring us as soon as possible. Silverfish infestations require a professional pest control treatment in order to kill the full life cycle of the insect. How do silverfish cause a problem? Although silverfish will not bite or sting you, they can damage to food, clothes, wallpaper and books. They will feed off almost anything — from a crumb on the floor to human dandruff. Once they have become established, Silverfish can spread quickly. They live for up to eight years and each female can lay up to 100 eggs. They have a very distinctive appearance which makes them easy to spot. The adult silverfish is silver, whereas young silverfish are white. They can be up to one inch long (2.5 cm) although some may be a lot smaller. Silverfish are nocturnal and most likely to be spotted in the bathroom or kitchen. Other favourite places are bookcases, newspapers and magazines or inside food cupboards. When looking for an infestation, damage to books or boxes in a humid area will be a key sign. You may also spot silverfish inside boxes of food. Why use Helliar silverfish control? Experienced technicians can identify and control infestations fast. Local, friendly staff who aim to work with minimum disruption to your home or business. Established company, trading for over 80 years in Somerset and Dorset.